The Central Board of Direct Taxes (CBDT) entered into Five Unilateral Advance Pricing Agreement with Indian taxpayers during June, 2017. A Bilateral Advance Pricing Agreement (involving United Kingdom) was also signed during the month. The APA Scheme endeavours to provide certainty to taxpayers in the domain of transfer pricing by specifying the methods of pricing and determining the arm’s length price of international transactions in advance for the maximum of five future years. Further, the taxpayer has the option to rollback the APA for four preceding years, as a result of which, tax certainty for a total period of nine years is provided. Since its inception, the APA scheme has attracted tremendous interest among Multi National Enterprises (MNEs). The APAs signed in June, 2017 pertain to healthcare, information technology and gaming/animation (media) sectors of the economy. The number of Unilateral APAs signed in the current financial year is now nine and the number of Bilateral APAs signed in the current financial year is one . With this, the total number of APAs signed since the commencement of the program till date stands at 162 (Unilateral-150 and Bilateral-12). The CBDT expects more APAs to be signed in the near future. The progress of the APA Scheme strengthens the Government’s commitment to foster a non-adversarial tax regime. 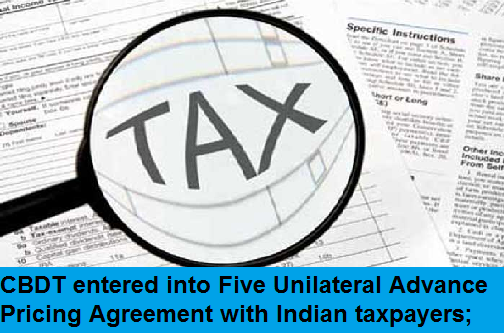 Bilateral Advance Pricing Agreement (involving United Kingdom) also signed The Central Board of Direct Taxes (CBDT) entered into Five Unilateral Advance Pricing Agreement with Indian taxpayers during June, 2017. A Bilateral Advance Pricing Agreement (involving United Kingdom) was also signed during the month.